As you can see from my latest posts, I’m still working away at my Great Canadian Cheese Festival articles. I better hurry up, because the summer agritourism season is now in full swing and there’s so much to write about. 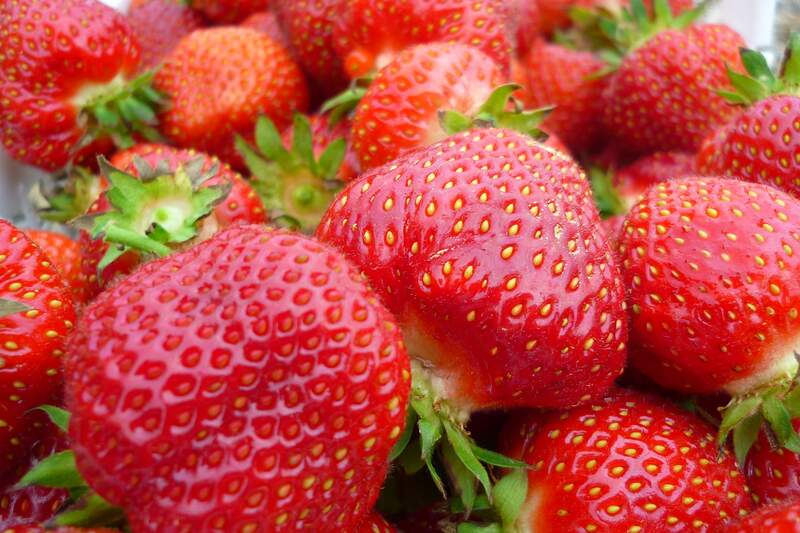 And what better way to start than to write about STRAWBERRIES!!!! Yes – finally – the pick-your-own strawberry season has begun, and to celebrate, I headed out yesterday to Cedar Hill Berry Farm in Pakenham. It was a race against the weather, as the skies were turning dark and the rain was on its way. But several days of hot, sunny weather had ripened the strawberries to perfection, and I was able to pick a 4 Litre basket in under 15 minutes. I’m a big fan of Cedar Hill Berry Farm, having visited them last December for their Christmas tree season (which you can read about here). The setting is so idyllic, with the farm located at the end of a dirt road, beside a small creek with a covered bridge. Your first stop for berry picking will be the barn beside the parking area. If you haven’t brought your own container, you can pick one up before heading to the field. Then you walk past the newly planted Christmas trees, over to the strawberry field, where you’ll be guided to the row where you’ll pick your berries. There’s lots of straw mulch between rows, so it’s comfortable (and clean) to sit down as you pick, which is nice for anyone who has trouble crouching for long periods.